This is what NASCAR should look like. But with stock chassis. This is 1990s Trans Am here. NASCAR has a lot of problems these days. It can’t get its diversity program right. It can’t detach from Trump. It has to remind drivers to take a breath between thanking sponsors because they keep passing out in post-race interviews. I’m not here to fix those problems. I can only address the biggest issue at hand. The cars. NASCAR is ready to go back to stock cars. Mustang versus Camaro versus Supra. To elaborate, the top Monster Energy NASCAR Cup Series is getting the Ford Mustang in 2019, replacing the front-wheel drive Fusion sedan/fastback/whateveryouwanttocallit, as Racer reporter Kelly Crandall just tweeted out. Add onto this that the Chevrolet Camaro is already in that top Cup Series, having replaced the Chevy SS. Add onto both of those that Toyota (currently running the Camry) is soon to be putting the Supra into production again. What is interesting about these three cars? They’re all rear-wheel drive from the factory. They are sporty, powerful GT cars that are easily converted from street cars into race cars. Could you say the same about the Ford Fusion? Not really. Could you say the same about the Chevy Lumina? Definitely not. NASCAR stopped running “stock cars” a long time ago, and it’s fair to understand why. 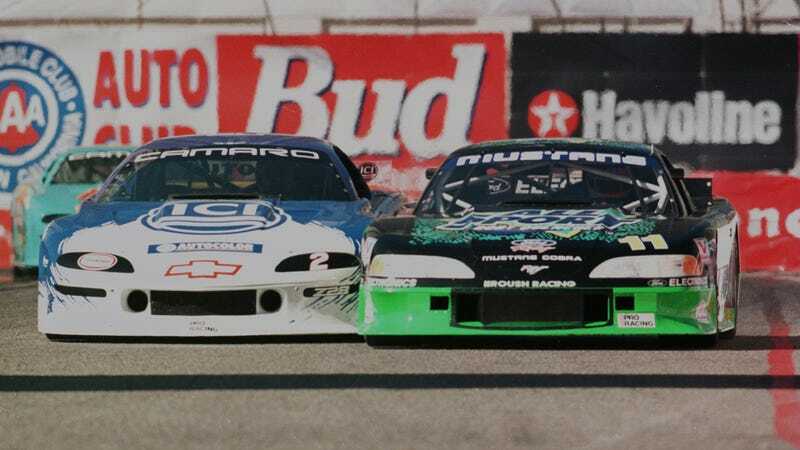 America just wasn’t building production cars that could be easily converted into NASCAR racers, at least not the popular ones that Detroit desperately wanted to promote. When just about everyone went front-wheel drive in the ’80s and ’90s, the distinction started to become clear that, say, Sterling Marlin’s Monte Carlo didn’t roll off the assembly line at any point. But with both GM and Ford no longer running their bread-and-butter family cars in the series, there’s no need to allow totally custom chassis. The Camaro and Mustang already run in GT racing, with modified stock chassis and uprated safety structures. The Toyota Supra isn’t even out yet and we’ve already seen what its racing version will look like. There’s little reason why we couldn’t adopt, say, Group A regulations for NASCAR and go back to stock. We could see Ford building 5,000 homologation special Mustangs, as with Chevy, as with Toyota, as with any other car company that wants in. Personally, I think Alfa and Jag have a shot at it. Right now NASCAR is struggling to inject any kind of personality into its racing, but it’s having a hard time without the strong manufacturer rivalries. There’s no point to root Ford vs Chevy when you know neither is stock and both are the same under the skin. Bring that back, bring back the energy, and everything else will follow.